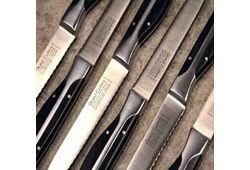 Quest Steak Knives complement the full line of Rastelli products. Their unique artisan design adds a classic steakhouse touch to your table and their extraordinary performance will make dining a delightful experience. This 6 piece set includes (6) steak knives.